Merkwaardige gezigten, gebouwen, monumenten en standbeelden in de noordelijke provintien van het Koningrijk der Nederlanden. 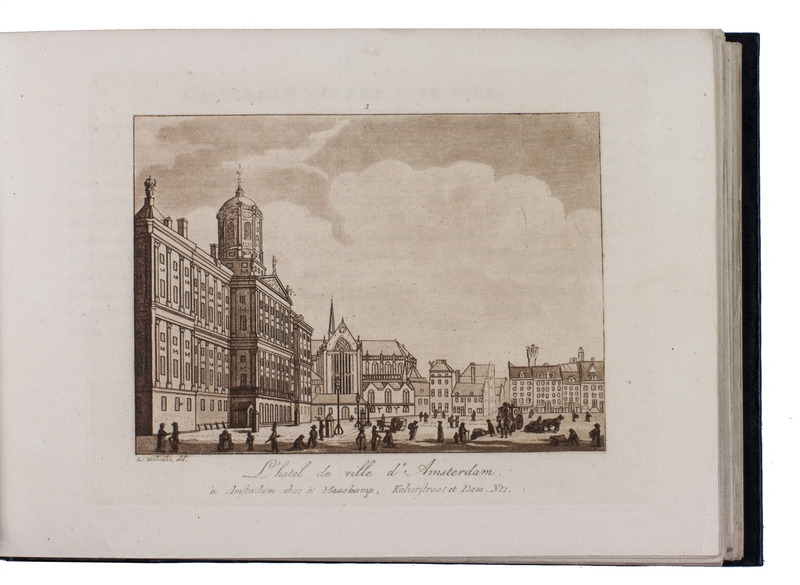 | Vues remarquables, edifices, monumens et statues dans les provinces septentrionales du Royaume des Pays-Bas.Amsterdam, Evert Maaskamp, 1816. Oblong 8vo. With an engraved illustration on title-page and 37 sepia aquatints by Ludwig Portman after Gerrit Jan Michaëlis, Franciscus Aandreas Milatz, and Cornelius Overman. Contemporary gold-tooled dark blue boards. Landwehr, Coloured plates 369; WorldCat (10 copies, including 2 undated). 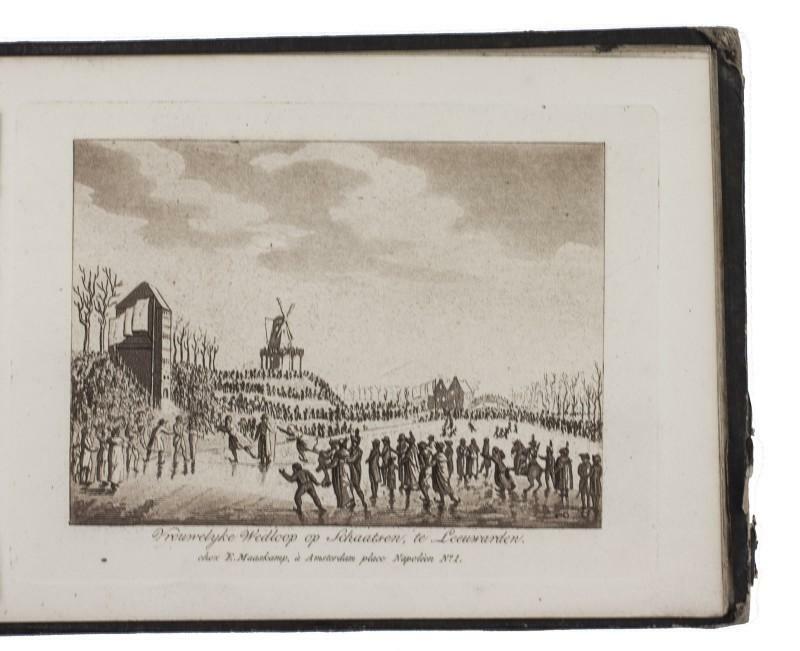 Fine copy of the first edition, one of three simultaneously published issues, of a touristic series of aquatint views of the Netherlands, published by Evert Maaskamp (1769-1834). It contains 37 sepia aquatints, showing architecture (including the Royal Palace of Amsterdam and the ruins of the castle at Wijk bij Duurstede), statues of Dutch national heroes such as Michiel de Ruyter and Erasmus, and several cities and harbours: Amsterdam, Utrecht, Broek in waterland, Nijmegen, Rotterdam, Vlissingen etc. Others depict scenes of Dutch culture, like ice skating and a funeral procession. Each aquatint is accompanied by a letterpress leaf explaining the illustration in both Dutch and French.Fine copy, only two small stains, not touching the plates, and some subtle, minor restorations to the spine. 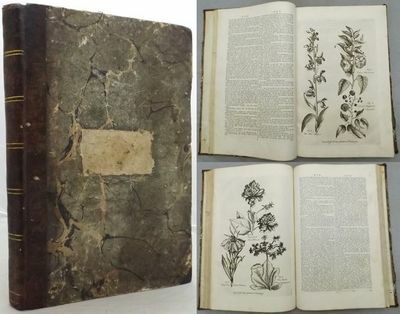 THE NEW GARDENER'S DICTIONARY; Or Whole Art of Gardening, Fully and Accurately Displayed; Containing The most approved Methods of cultivating all Kinds of Trees, Plants, and Flowers; With Ample Directions for performing all the Operations in Gardening; Whether they relate to I.The Hot-House, II. The Green-House, III. The Shrubbery, IV. The Kitchen-Garden, V. The Flower-Garden, or VI. The Fruit-Garden. According to the Practice of the Best Modern Gardeners, Arranged under the English proper Name of each Article. Henrey, B. 628. 'Some copies of the above work have a title-page reading: A new gardeners dictionary ... Printed for Francis Blyth.. T. Evans .. and J. Coote ... 1769. The frontispiece and thirteen plates of plants were also published Hanbury's Complete body of planting and gardening. Oxford: Hearne, Thomas, 1769. No dust jacket. Hardcover. Leather binding. Nine-volume set in five books. 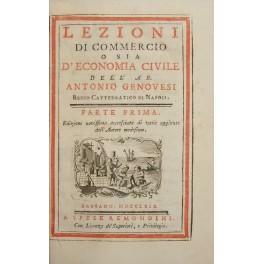 Third edition, published in 1769. Vol. I was published in 1770. Decorative edge on boards. Boards have several marks, scores and chips. Front boards of Vols. I-II and V-VI are detached from spines. Rear boards of Vols. I-II and V-VI are loosely attached to spines. Spines have several chips and abrasions. Section of spine foot of Vols. I-II is missing. Two sections of the spine of Vol. IX is missing. Leading corners are bumped and split. Marbled page blocks. Library plates of two previous owners on all front pastedowns. Minor foxing and fading on pages, taking the item's age into consideration. Text of Vol. IX is in Latin. Latin text at a few further points. The contents remain clear. AF. Hardcover. Good. Used. Merkwaardige gezigten, gebouwen, monumenten en standbeelden in de noordelijke provintien van het Koningrijk der Nederlanden. | Vues remarquables, edifices, monumens et statues dans les provinces septentrionales du Royaume des Pays-Bas.Amsterdam, Evert Maaskamp, [ca. 1816]. Oblong 8vo. With an engraved illustration on title-page and 37 sepia aquatints by Ludwig Portman after Gerrit Jan Michaëlis, Franciscus Aandreas Milatz, and Cornelius Overman. Contemporary gold-tooled boards. Korte en eenvoudige handleyding tot het leeren van 't clavecimbel of orgel-spel. Tweede druk.Gouda, Johannes vander Klos, 1768. 4to. With an etching showing types of musical notes in text and a folding etched plate showing several aspects of staff notation. Modern cloth. [Advertisement] in: Opregte Haerlemse courant, 27 (1769), p. ; Boers, "Bouwstoffen tot eene Nederlandsche muzikale litteratuur", in: Caecilia VI, 2 (1849), p. 15; STCN (2 copies). Very rare second and enlarged edition of an introduction in learning to play keyboard instruments. In the preface, the author writes that the first edition of the treatise was highly praised and quickly sold out. As this necessitated a second edition, he used the occasion to add "everything which came to my mind while instructing [from the book]" (*2r) and include an engraved plate. In this "short and simple manual" the author gives the basics of musical staff notation and of playing basso continuo. Over the next 50 years, the book went through numerous editions but at the time proved to be too complicated for beginners. 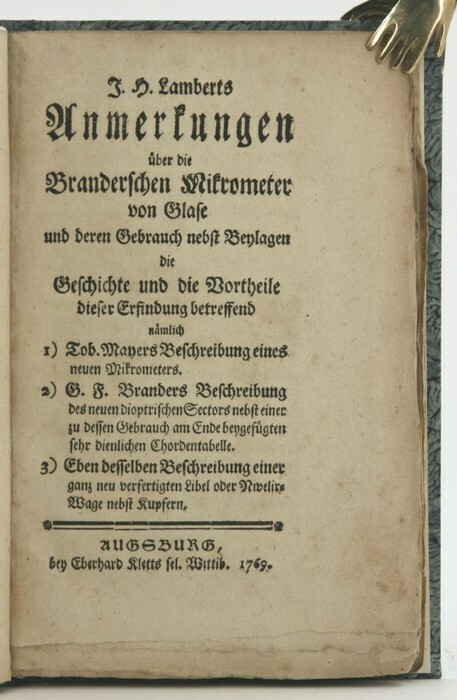 Therefore, Hess wrote a simplified edition of the book, containing more explanations and an extra illustration, which was published in 1808. No copies of the first edition of the Korte en eenvoudige handleyding could be located, nor could they be identified in any source (cf. Boers).Joachim Hess (1732-1819) was an organist and writer, who wrote several treatises on organs and organ playing. For almost sixty years he played the Moreau organ in the Sint-Janskerk in Gouda, which was changed according to his specifications. In his publications he gives great knowledge of all matters related to the organ and he was famous throughout the Netherlands for both his writing and his playing.With the title-page and the inner part and outer margin of the folding plate browned where they touch the endpapers; a good copy. A state of the evidence in the cause between His Grace the Duke of Hamilton, and others, pursuers, and Archibald Douglas, of Douglas, Esquire, defender. With remarks. Recueil des rits et cérémonies du pelerinage de la Mecque, auquel on a joint divers ecrits relatifs à la religion, aux sciences & aux Mœurs des Turcs.Amsterdam; Paris, Jean Desaint and Charles Saillant, 1754. 8vo. Contemporary mottled, tanned sheepskin, gold-tooled spine. Atabey 470; Blackmer (auction) 607; Hage Chahine 1769. 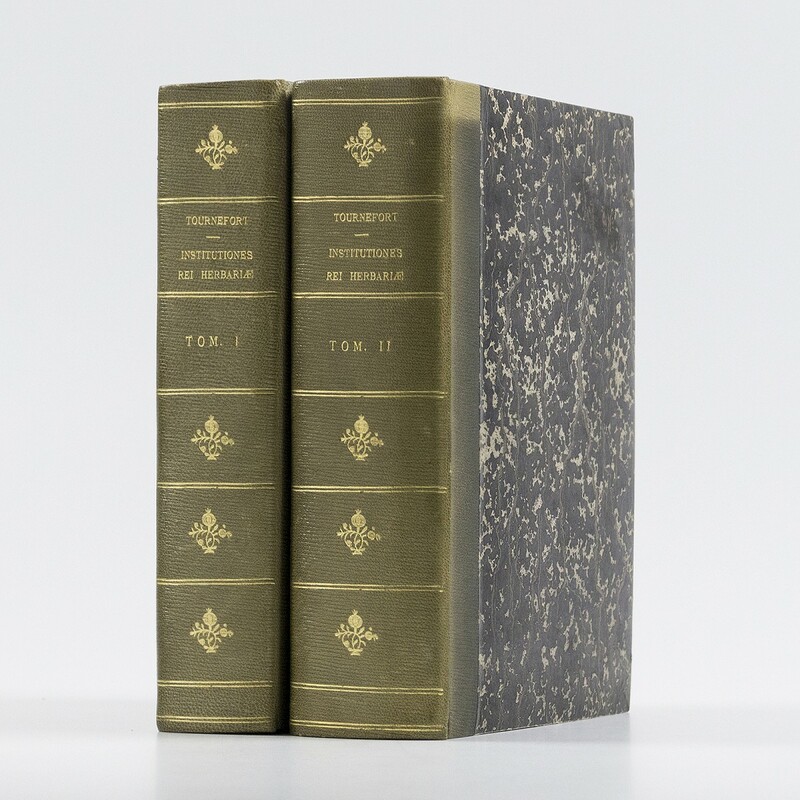 First and only edition of a translation into French of three Arabic and Turkish treaties, followed by two eyewitness accounts of the author's life. The first treatise covers the rituals surrounding the pilgrimage to Mecca, including descriptions of many of the important shrines and sites within the city, the other two concern the religion, science and manners of the Arabs and Turks. The author added his own description of Chios and of the marriage of Sultana Esma with Yakub Pasha, governor of Silistria. Julien-Claude Galland, nephew of the celebrated orientalist Antoine Galland, was an interpreter in the Levant who translated many works into French.A very good copy, some leaves slightly browned. Binding also very good, only slightly worn along the extremities. London: Printed for J. Dodsley, 1769. In four volumes. , vi-vii, , 240; , 240; , 223, ; , 213pp, . Without half-titles to Vols. I, II, and IV, without title-page to Vol. III. Contemporary half-calf, marbled boards, gilt, marbled edges. A trifle rubbed, particularly to joints. Marbled endpapers, internally clean and crisp but for very occasional light spotting. The first edition of this epistolary romance of colonial courtship, partly set in Canada. The author Frances Brooke, resided in Quebec and Sillery between 1763 and 1768 where her spouse served as chaplain of the garrison. The work, dedicated to Sir Guy Carleton, Governor of Quebec, was well received by the The British Canadian Review who termed the descriptions of the Canadian scenery and portrayal of Quebec society as 'racy'. ESTC T72176.. First edition. 12mo. The Life and Most Surprising Adventures of Robinson Crusoe, of York, Mariner. - Who lived eight and twenty years in an uninhabited island on the coast of America, near the mouth of the great river Oroonoque. Reizen rondom de weereld, ondernomen . . . tot het doen van ontdekkingen in het zuider halfrond . . . Including : BYRON, John . [Drop title:] Verkort verhaal der reizen . . . Tocht van den Kommandeur Byron. WALLIS, Samuel . 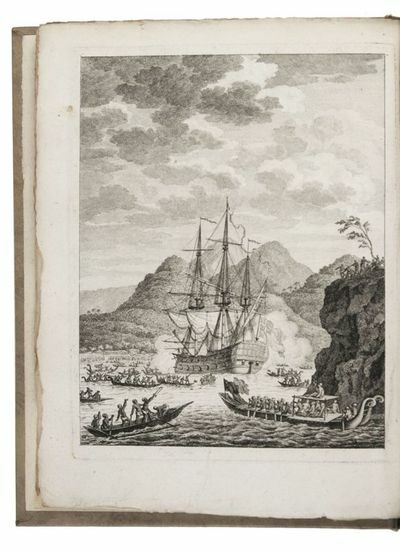 Verkort verhaal eener reize rondom de weereld, gedaan in de jaaren 1766, 1767 en 1768. . . . voerende des Konings schip Den Dolphyn. CARTERET, Philip . Verkort verhaal eener reize rondom de weereld, gedaan in de jaaren 1766, 1767, 1768 en 1769. . . . voerende des Konings sloep De Swaluw. COOK, James . Verkort verhaal eener reize rondom de weereld, gedaan in de jaaren 1769, 1770 en 1771. . . ., voerende 's Konings schip, Den Onderneemer.Rotterdam, Reinier Arrenberg, 1774. 4to. With an engraved frontispiece. 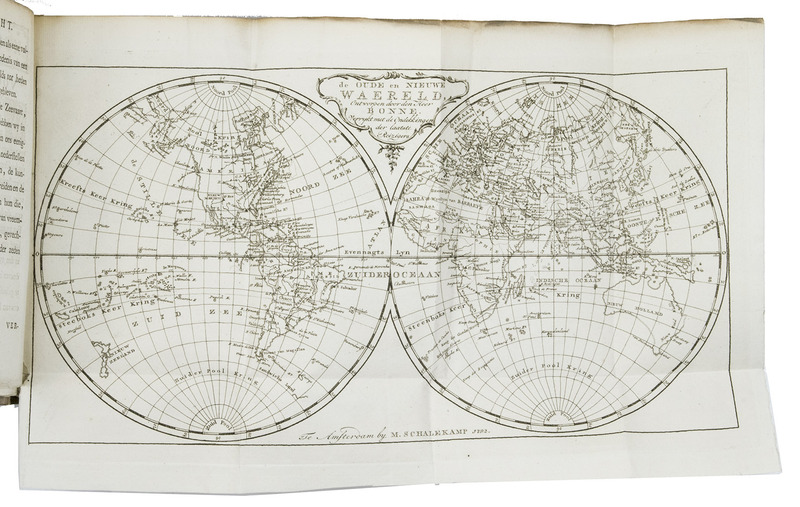 With an extra folding engraved world map in 2 hemispheres incorporating Cook's recent discoveries: Rigobert Bonne, De oude en nieuwe waereld . 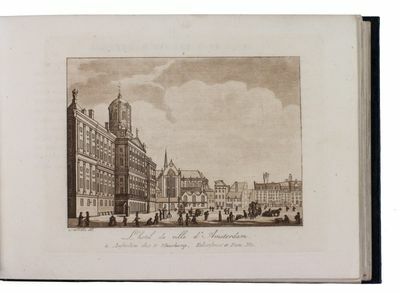 . . verrykt met de ondekkingen der laatste reizigers , Amsterdam, 1792 (23×41.5 cm). Modern cloth. Untrimmed. Beddie 658; cf. Hill 783; Holmes 5; Sabin 30945; O' Reilly & Reitman 367-370. First Dutch edition of an important collection of accounts of recent English maritime expeditions, including Cook's first expedition, edited by John Hawkesworth. "John Byron, in the Dolphin , visited the Tuamoto Islands and Nikunau in what would later be called the Gilbert Islands . . . Captain Wallis, also in the Dolphin , discovered the volcanic island of Tahiti, which he named King George III Island, and Moorea . . . Captain Carteret, in command of the Swallow , became separated from Captain Wallis and was feared lost. He discovered Pitcairn Island and some remote atolls in the South Seas. The first voyage under the not-yet-famous Captain Cook's command, on the Endeavour , was primarily of scientific nature . . . Entering the Pacific around Cape Horn, Cook reached Tahiti in 1769 and carried out the necessary astronomical observations. Excellent relations with the Tahitians were maintained, and Sir Joseph Banks . . . and Daniel C. Solander carried out extensive ethnological and botanical research. Leaving Tahiti in July, Cook discovered, named, and charted the Society Islands, and . . . explored New Zealand . . . Cook then headed towards Australia and discovered and charted the eastern coast . . ., naming the area New South Wales. Cook's discoveries won him prominence, promotion, and the opportunity to sail again. They also ensured John Hawkesworth's position in maritime literary history, as the official chronicler of Cook's first voyage'' (Hill).With some water stains at the head of 1 quire (O) and the top edge of the map dirty, but otherwise in fine condition and wholly untrimmed. First Dutch edition of 4 English maritime expeditions, including Cook's first expedition. 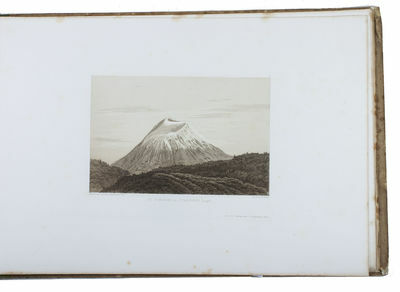 Volcans des Cordillères de Quito et du Mexique.Paris, Gide and J. Baudry (colophon and back of half-title: printed by E. Thunot & Co.), 1854. Oblong 4to. With 12 engraved plates, of which 9 tinted views, 2 plans and 1 cross section. Half cloth, original printed paper sides. Grafik, karta. Atlas with 9 folding, military plans, bound in a contemporary full leather binding.Raised binds and gilt ornamented spine.Marbeled endpapers. 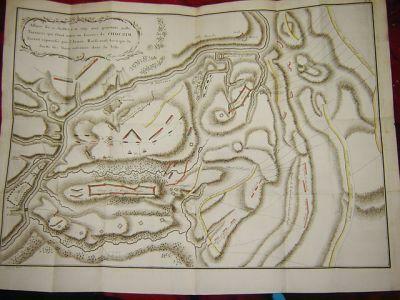 The maps are partly coloured.Battles dated 1769.Full exposed the plans are in folio. All in VG condition. Ask for more information and photos. 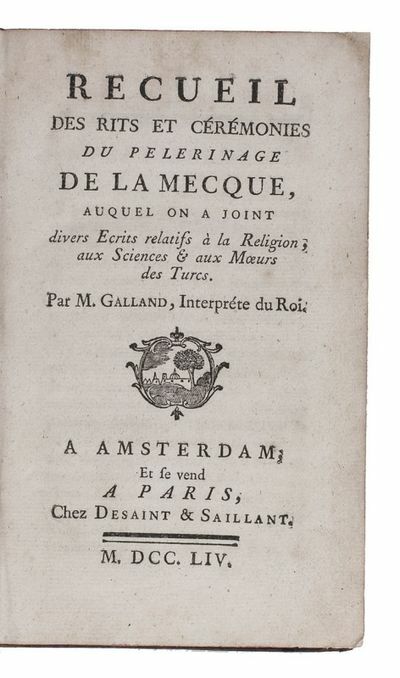 Recueil des rits et cérémonies du pelerinage de la Mecque, auquel on a joint divers ecrits relatifs à la religion, aux sciences & aux M&#156;urs des Turcs.Amsterdam; Paris, Jean Desaint and Charles Saillant, 1754. 8vo. Contemporary mottled, tanned sheepskin, gold-tooled spine. - Atabey 470; Blackmer (auction) 607; Hage Chahine 1769. 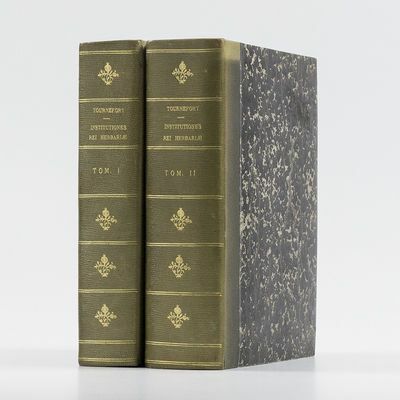 First and only edition of a translation into French of three Arabic and Turkish treaties, followed by two eyewitness accounts of the author's life. The first treatise covers the rituals surrounding the pilgrimage to Mecca, including descriptions of many of the important shrines and sites within the city, the other two concern the religion, science and manners of the Arabs and Turks. The author added his own description of Chios and of the marriage of Sultana Esma with Yakub Pasha, governor of Silistria. Julien-Claude Galland, nephew of the celebrated orientalist Antoine Galland, was an interpreter in the Levant who translated many works into French.A very good copy, some leaves slightly browned. Binding also very good, only slightly worn along the extremities. Paris: Chez Lacombe, Libraire, Quai De Conti. Very Good. 1769. Hardcover. Title Continued: Avec L' explication detaillee de la vertu & de la maniere d'agir des Medicamens Chymiques. . Et les principes fondamentaux des Arts, Manufactures & Metiers dependans de la Chymie. Full clean leather with raised bands and gilt decorated panels. Page edges dyed red. Marbled endpaper. This is the 1769 reprint of the 1766 first edition. Vol # 1 (xxiv) ,616pp. : VG. Vol. #2, . 688pp. : VG+. 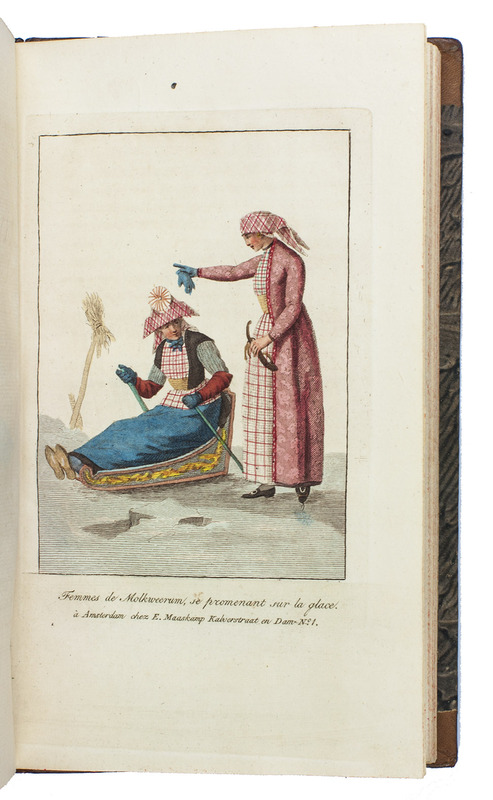 Illustrated with head & tail piece vignettes. Chemistry dictionary containing the theory of science, medicine and natural history with detailed explanation. Vol #1 has chip on spine head. Science, Medicine ; Vignettes; 12mo 7" - 7½" tall; 1329 pages . Observations on the expediency of shipbuilding at Bombay, for the service of His Majesty, and the East India Company.London, printed for Longman, Hurst, Rees, Orme and Brown (printed by Elizabeth Blackader), 1811. 8vo. 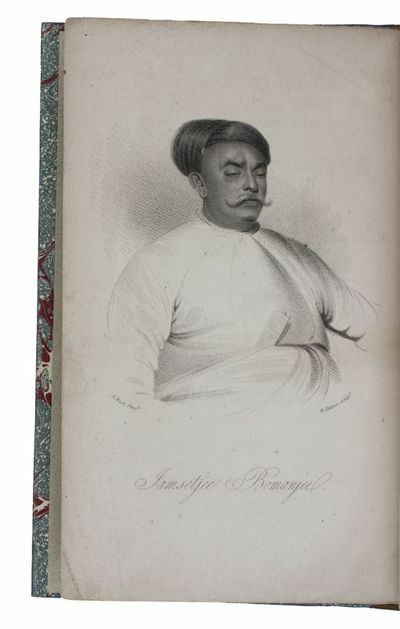 With a stipple-engraved frontispiece portrait of the Bombay shipbuilder Jamsetjee Bomanjee, drawn by Edward Nash and engraved by William Haines. Modern half calf in convincing period style, gold- and blind-tooled spine. Goldsmith's Lib. 20255 (not noting the plate); Kress Lib. B5872 (lacking 2 ll. and not noting the plate); not in Bradley; Bruzelius. First and only edition of a detailed series of arguments promoting the use of Indian teak for shipbuilding, by William Money (1769-1834), superintendent of the Bombay Marine Board from 1803 to 1810 and later director of the British East India Company. He argues that teak is superior to oak for ships sailing in warm waters because it resists worm damage and notes that it is abundantly available on India's western Malabar coast, while there was a great scarcity of English Oak. He therefore suggests the British East India Company have ships built in India, avoiding the expense of shipping the wood to the London shipyards. Author's presentation copy, with "from the author" at the head of the title-page and with a July 1812 inscription by what must the recipient, J.D. Thompson, perhaps meaning the Breconshire magistrate James Duncan Thomson (d. 1851). With a tear and a couple creases in the last leaf, and a slight offset from the engraved portrait onto the title-page, but the book and binding are otherwise in very good condition, with generous margins. An important and detailed primary source for the history of shipbuilding in India. Abregé de l'histoire de la ville de Jérusalem, ...Lille, Van Costenoble pere & fils, 1769. 8vo. With folding engraved plan of Jerusalem. Modern mottled half calf, paste-paper sides. Hage Chahine 27; Labarre, Répt. bibl. 4271 (Lille); WorldCat (4 copies). A rare history and description of Jerusalem, written by an anonymous French missionary and printed at Lille in French Flanders. Divided into 2 parts, it successively treats the history and the present state of Jerusalem. The book is directed at missionaries working in Jerusalem and Christians interested in the history of the city. The second part describes the Christian holy sites, which the author had visited himself, including the tomb of the Virgin Mary, the Garden of Gethsemane, the house of Pilatus, the Via Dolorosa, etc. The plan shows 49 important sites.First leaves and the plan somewhat soiled, but still in very good condition. [Series of 3 coloured jigsaw puzzles]. La veille d'Austerlitz. With : La Nuit de Lodi. With : Clémence de l'empéreur.Paris, Ulysse, [ca. 1815]. Each puzzle measures 19.5 x 24.5 cm. Each puzzle with an engraved plate mounted on thin wood, coloured by a contemporary hand and cut to form a jigsaw puzzle, with engraved caption and short description below the image. Kept in the original cardboard box (!) with an etched and engraved sample plate for a fourth puzzle (with caption «Équité de l'empereur») on the top, coloured by a contemporary hand, and an embossed gilt-paper border, each puzzle with the original pink paper wrap-around slip preserved. A nice and colourful set of jigsaw puzzles depicting scenes from the life of Napoleon Bonaparte (1769-1821), 2 of the puzzles and the sample plate with address «Ulysse Paris» engraved in the image. Each puzzle has 20 pieces. The first depicts Napoleon Bonaparte calmly sleeping in a chair after having given orders to his generals on the eve of the battle of Austerlitz (1 Dec. 1805). 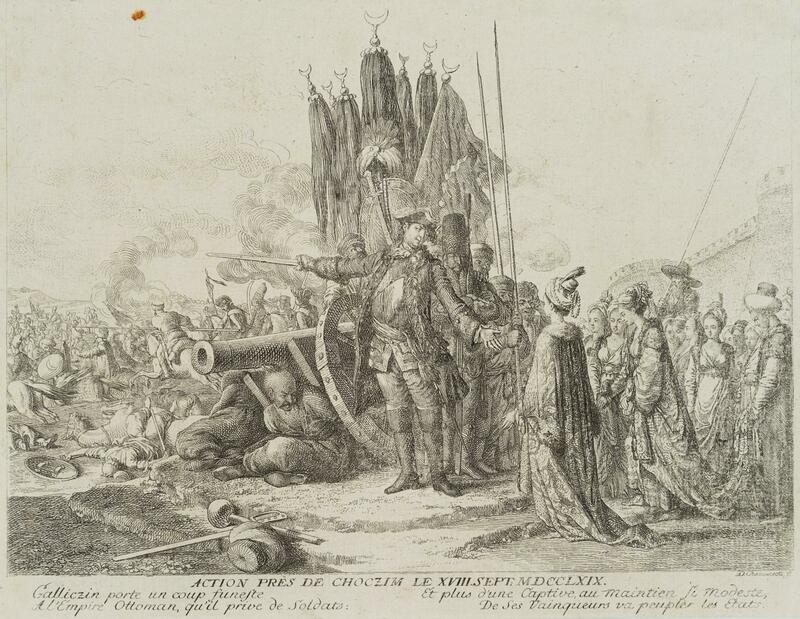 The second shows a still fresh Napoleon addressing an exhausted soldier, a scene from the terrible battle at Lodi, Italy, 10 May 1796, between French forces under Napoleon Bonaparte and the Austrian rear guard led by Johann Beaulieu. The third shows Napoleon as merciful Emperor, receiving the thankful wife and children of a Prussian lord accused of conspiracy, but whom he nonetheless pardoned.The puzzle matching the scene mounted on the top of the box is not included; a few pieces cracked at thin spots; box slightly defective with traces of use and browned. A good set. Brander, Georg Friedrich. Lambert, Johann Heinrich. Mayer, Tobias. Anmerkungen über die Branderschen Mikrometer von Glase und deren Gebrauch nebst Beylagen die Geschichte und die Vortheile dieser Erfindung betreffend. BMC NH, p. 889; Sabin 33749; cf. Löwenberg 219; Ward 1154. First French edition of a series of 12 plates (with letterpress descriptions) concerning volcanoes of the Andean Cordillera, around Quito and Mexico, after drawings by the great German naturalist and geographer Alexander von Humboldt (1769-1859). This area was named "the avenue of volcanoes" by Humboldt in 1802 as there is no other place in the world with such a high concentration of volcanoes.It was originallly published in German as Umrisse von Vulkanen aus den Cordilleren von Quito und Mexico as part of Humboldt's Kleinere Schriften (1853) and this first French edition is published as the atlas volume of Mélanges de Géologie et physique génerale but often found separately.Good copy, with several spots. Voyage dans l'intérieur de la Hollande, fait dans les années 1807-1812.Amsterdam, Evert Maaskamp, [ca. 1812]. 3 volumes. 8vo. With an engraved title-page in each volume, 37 sepia aquatint views and 20 hand-coloured engraved costume plates, engraved by G.J. Michaëlis, P.A. Milatz, L. Portman, and others. Slightly later half calf; in a calf slipcase. Engraved vignette on title & four folding engraved plates. 111,  pp. 8vo, attractive antique speckled calf (some foxing), double gilt fillet round sides, spine gilt, red morocco lettering piece on spine. 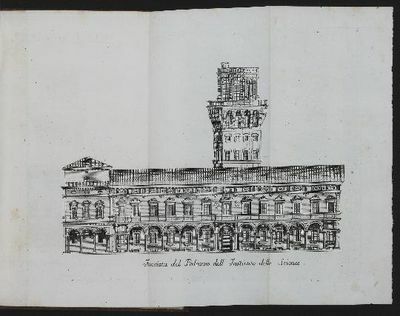 Bologna: Lelio dalla Volpe, 1769. Fourth edition (1st ed. : 1751) of the history of the origins and activities of the Academy of Sciences of the Institute of Bologna (founded in 1714), one of the leading scientific academies of the 18th century. Very good copy. â§ Riccardi, I, 145-"Abbiamo registrato questo libroâ€¦per l'importanza che esso presenta per la storia della scienza.". Amsterdam, zeilen op 't IJ - Simon Fokke, 1768. AMSTERDAM - STADHOUDER WILLEM V, EEN FEESTELIJKE ZEILTOCHT OP 'T IJ ?Afbeelding van het Zeiltogtje Hunner Doorluchtige en Koninklijke Hoogheden, (...), Gehouden op het IJ.? Kopergravure vervaardigd door Simon Fokke, uitgegeven door Johannes Smit tussen 1769 en 1773. Later met de hand gekleurd. Afm. : 29,5 x 38,5 cm. In lijst.Van 30 mei tot en met 4 juni 1768 bracht het stadhouderlijk paar Prins Willem V en Prinses Wilhelmina van Pruisen een bezoek aan Amsterdam.De Amsterdamsche Courant schrijft: op de 31ste mei stappen de Doorluchtige Personagien bij den Haarlemmersluis in het Groote Admiraliteits Jagt en worden bij het afzeilen begroet met 21 Schooten uit het Canon dezer Stad, en vervolgens gesalueerd door alle op de Rede liggende Schepen en Jagten. Het Admiraliteits Jagt werd toen geboegseerd met Roeibooten, wijl er weinig wind was en naar Zaandam geaccompagneerd, door 5 a 6 Jagten, benevens een aanzienlijke menigte van groote en kleine Vaartuigen. Hunne Doorluchtige en Koninklijke Hoogheden op gemelde plaats aangekomen zijnde, bezigtigden dezelfde, en bezagen de Kerk aan de Westzijde, gemeenlijk de Bullenkerk genaamd; van daar roeide het Jagt een gedeelte van de Zaan op en hunne Hoogheden stapten vervolgens aan de Oostzijde uit en bezigtigden aldaar ingelijks de Kerk. De Inwoners hadden op twee plaatzen Eereboogen van Groente en Gebloemte, met Inscriptien daarboven opgerigt, door welke hunne Hoogheden passeerden met Hoogstderzelver gevolg, ten 6 uuren, deze Stad, voeren tot aan Pampus even voorbij den Vuur-Toren, en ankerden bij derzelver Retour terstond bij ?t Oorlogschip, dat voor ?s Lands Werf op de Rede lag, zijnde versierd met allerlei soorten van Vlaggen: welk schip des avonds geheel geillumineerd was; alwaar hunne Hoogheden ook gesoupeerd hebben, en zijn vervolgens aan de Mosselsteiger weer aan Land gestapt.Prijs: ?1.250,- (incl. lijst). Woodcut printer's device on titles. 4 p.l., xxvii, , 368 pp. ; 547 pp. Large 4to, cont. Italian red morocco (covers of Vol. 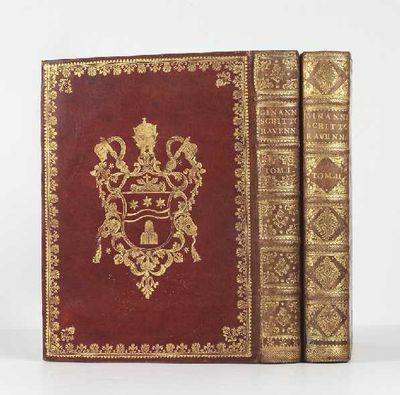 II a little rubbed), sides richly gilt with the arms of Pope Clement XIV in gilt in center of each cover, spines richly gilt (each tooled slightly differently), a.e.g. Faenza: G.A. Archi, 1769. First edition, and a very handsome set with the arms of Pope Clement XIV on covers, of the first bio-bibliographical guide to the writers of Ravenna; about 2500 works by more than 600 authors are included. Ginanni (1698-1774), the learned Italian bibliographer and historian, was a professor in Florence and then in Ravenna where he developed a great knowledge of Italian history and writers. He formed an important collection of books and medals and was a member of many academic societies. Very fine set. Stamp on titles of the Biblioteca Piervissana on titles. From the library of A.R.A. Hobson with bookplate. â§ Besterman 5346. N.B.G., Vol. 20, cols. 570-71. Series of 3 coloured jigsaw puzzles]. La veille d'Austerlitz. With: La Nuit de Lodi. With: Clémence de l'empéreur.Paris, Ulysse, [ca. 1815]. Each puzzle measures 19.5 x 24.5 cm. Each puzzle with an engraved plate mounted on thin wood, coloured by a contemporary hand and cut to form a jigsaw puzzle, with engraved caption and short description below the image. Kept in the original cardboard box (!) with an etched and engraved sample plate for a fourth puzzle (with caption «Équité de l'empereur») on the top, coloured by a contemporary hand, and an embossed gilt-paper border, each puzzle with the original pink paper wrap-around slip preserved. 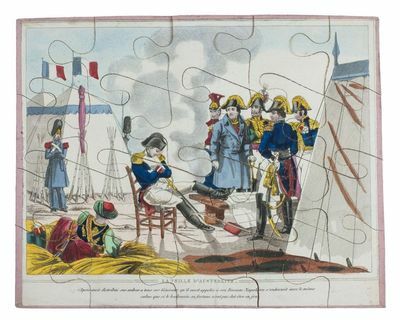 - A nice and colourful set of jigsaw puzzles depicting scenes from the life of Napoleon Bonaparte (1769-1821), 2 of the puzzles and the sample plate with address «Ulysse Paris» engraved in the image. Each puzzle has 20 pieces. The first depicts Napoleon Bonaparte calmly sleeping in a chair after having given orders to his generals on the eve of the battle of Austerlitz (1 Dec. 1805). The second shows a still fresh Napoleon addressing an exhausted soldier, a scene from the terrible battle at Lodi, Italy, 10 May 1796, between French forces under Napoleon Bonaparte and the Austrian rear guard led by Johann Beaulieu. The third shows Napoleon as merciful Emperor, receiving the thankful wife and children of a Prussian lord accused of conspiracy, but whom he nonetheless pardoned.The puzzle matching the scene mounted on the top of the box is not included; a few pieces cracked at thin spots; box slightly defective with traces of use and browned. A good set. Paris: Imprimerie Royale, 1769 - 1770. Hardcover. Good. 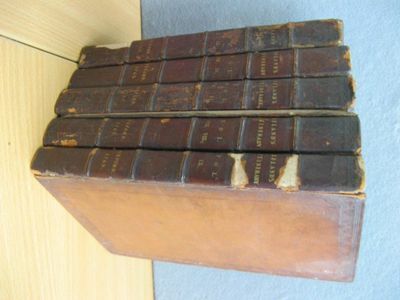 14 volume with Volume III of the Supplement. Bound in contemporary French mottled calf. Gilt stamps spines. Good bindings and covers. Some minor edge wear. All edges red. Marginal dampstaining, affecting plates in Volume 9. Occasional spotting, marginal soiling. Supplement and Volumes 7 and 8 have sprung leaves. 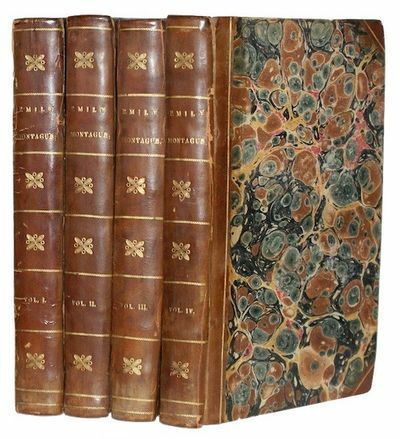 Profusely illustrated with 202 engraved plates, 2 folding maps, folding chart. Georges-Louis Leclerc, Comte de Buffon, was a noted scientist whose monumental works in natural sciences influenced the next two generations of naturalists, including Jean-Baptiste Lamarck and Georges Cuvier. (Mayr, The Growth of Biological Thought. p 330) Buffon's work was based on the methods of observation and experimentation. He raised many of the fundamental problems of biology in a scientific context. One of Buffon's most important contributions was the popularization of the old earth theory, in opposition to Archbishop Ussher's biblical earth time-line. Buffon was an important pre-cursor to Darwin. Cited as the father of biogeography, Buffon's Law postulated that creatures "improved" and "degenerated" after dispersing from a center of creation. He based his theory on comparative anatomy studies. Buffon tried to explain the origin of living things by spontaneous generation of elementary particles and its development as a consequence of climate and diet. Buffon argued that all members of a family of species descended from the same ancestors, a "unity of type". Contents:T. 1. Premier discours. Second discours. Preuves de la theorie de la terre: article I-VIII --t. 2. Article IX-XIX. Conclusion --t. 3. Histoire generale des animaux: chapitre I-IX --t. 4. Chapitre X-XI. Recapitulation. Histoire naturelle de l'homme --t. 5. Varietes dans l'espece humaine. Discours sur la nature des animaux. Letters de MM. les deputes & syndic de la Faculte de theologie a M. de Buffon, avec les reponse & declaration de M. de Buffon. Discours prononce a l'Academie francoise --t. 6. Les animaux domestiques --t. 7-12. Les animaux sauvages --t. 13. Concordance & table alphabetique des noms pour les animaux quadrupedes. Supplement III. This is an oversized or heavy book that requires additional postage for international delivery outside of Canada and the US. PIRANESI Giovanni Battista [o Giambattista]. Tavola raffigurante un camino decorato con elementi egizi. Tratta dall'opera "Diverse maniere d'adornare i cammini ed ogni altra parte degli edifizj desunte dall'architettura egizia, etrusca, e greca". [In Roma, nella stamperia di Generoso Salomoni, 1769], incisione in rame all'acquaforte, mm. 250x381 (l'impronta dalla lastra), mm. 440x587 (il foglio). Firmata in lastra in basso a sinistra: "Cavaliere Piranesi inv. ed inc." Numerata in lastra in basso a destra: 14. Magnifica prova, impressa ad inchiostro nero su carta vergata coeva, filigrana non leggibile. Ottime condizioni, a pieni margini. 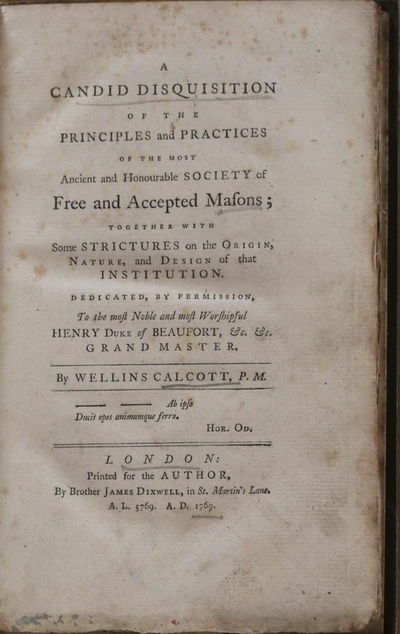 A candid disquisition of the principles and practices of the most ancient and honourable society of Free and Accepted Masons; together with some strictures on the origin, nature, and design of that institution. Dedicated, with permission, to the most noble and most worshipful Henry Duke of Beaufort, &c. &c. Grand Master. 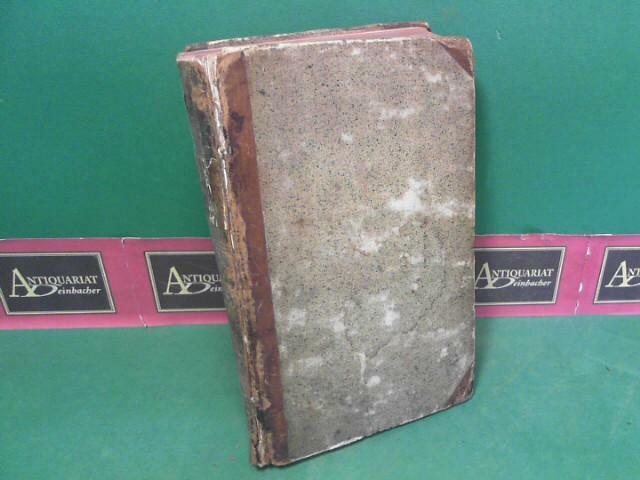 London, printed for the author, by Brother James Dixwell 1769.. 2 Bll., XXXII, 243 S. Dekorativer grüner HLdr. des 19. Jhdts., mit Rückenschild und goldgepr. Freimaurersymbolen am Rücken. Wolfstieg 1363. - Erste Ausgabe. - Mit einem Stempel der Gordon Lodge, Hanley. - Aus der Charlesworth Masonic Library. - Unbeschnitten. Tls. etwas fleckig. Lyon, Typographia Regia, 1769. Three parts in two thick volumes. 4to (24.8 x 19.1 cm). Two engraved titles and one engraved title vignette, one nice engraved text vignette; xxxii, [xvi], 695, [vi], 58 pp., and 489 engraved plates. Uniform contemporary style grained half morocco over marbled boards. Spines with gilt lines, vignettes and title. Marbled endpapers.l This edition includes the "Tabulae Generum" (58 pp.) and "Corollarium Institutionum Rei Herbariae in quo plantae 1356 munificentia L. Magni in orientalibus reg. obserratae recensentur..." (3 ll.). "The significance of Tournefort to eighteenth-century botany, and to that of today, lies in his having classified all plants into genera... The Institutiones (1700) was in the main a translation of the Eléments de botanique into Latin; and the Corollarium Institutionum Rei Herbariae (1703) was a supplement written on his return from his travels into the Near East, describing 1350 genera which he had found there." (Hunt). This is a later printing of the third (1719) edition, which is much more common. A nice copy with broad margins. Plate 270 bound in upside down; tear in the lower margin of the half title to the "Tabulae generum"; inoffensive dampstain to the gutter, only in the rear, a bit more so on the very last few leaves. Some very light spots in the margins of the text and one plate repaired at the edge. Overall a very good copy, with broad margins. Hunt 450; Nissen BBI, 1977; Stafleu an Cowan, 14.783. Hollandsche zee-schepen.With: (2) Beknopte beschrijving der takelaadje van een driemast koopvaardijschip.Amsterdam, Evert Maaskamp, [ca. 1810]. 8vo (19.5 x 16 cm). With 6 aquatint plates to ad 1 and an engraved plate to ad 2. 20th-century brown roan. - Ad 1: Maritiem Digitaal (1 copy); NCC (no location); not in De Groot & Vorstman; Cat. NHSM; WorldCat; ad 2: Maritiem Digitaal (1 copy); not in Bruzelius; NCC; WorldCat. Extremely rare series of Dutch sea ship prints, containing 6 aquatints and a letterpress title-page defining the different ships, published and engraved by the Amsterdam-based publisher Evert Maaskamp (1769-1834). The aquatints show two cutters, two frigates, a yacht and a "smak", all depicted at sea. 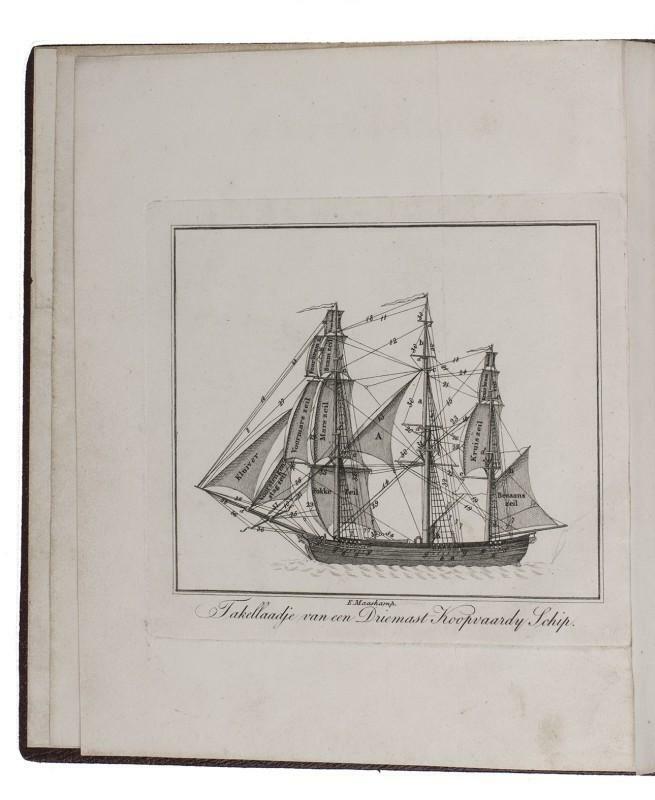 The plates are accompanied by an equally rare, small booklet on the rigging of a Dutch three-master merchant ship, also published by Maaskamp. It briefly discusses the masts, sails and cordage of the ship, all illustrated on an engraved plate.With bookplate on paste-down. Each leaf and each plate is mounted on a stub. Slightly browned and slightly foxed, but otherwise in very good condition. Binding only slightly rubbed along the extremities.